Where is God when one is experiencing the pain of chronic illness? He may have the whole world in His hands, but sometimes it feels like He trips, hollering "Oops!" as we are flung from His hands, and our lives shatter into pieces. We look at the fragments of our former self, relationships, careers, and dreams, and wonder, "Where did I go wrong? Why did God allow this into my life? Will God ever heal me?" 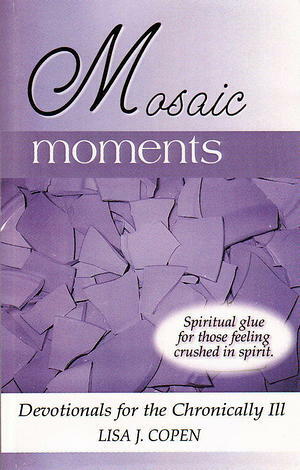 Mosaic Moments is filled with over 200 devotionals that encourage readers to remain hopeful in the face of illness, because even though they may feel like a broken pot, God is transforming them into something noble—a mosaic! This book is spiritual glue for those feeling crushed in spirit. Through Lisa's devotionals and the contributions of twenty writers, readers will discover that, despite the pain of feeling broken, God is working through their illness to create a precious work of art where they will find unexpected joy. Each devotional includes scripture and prayer, and the end of the book has concluding thoughts with a call for the reader to dedicate his or her life to Christ.